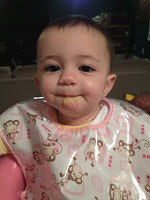 As I understand it, there are many different views and opinions on how to introduce a baby to solid foods. I think of the two main camps as “old school” and “new age.” Based on my unofficial research among my “New Mommy Friends”, your camp has to do with your own opinion/comfort level and your pediatrician. Our pediatrician is from the “new age” camp and that works just fine for me. 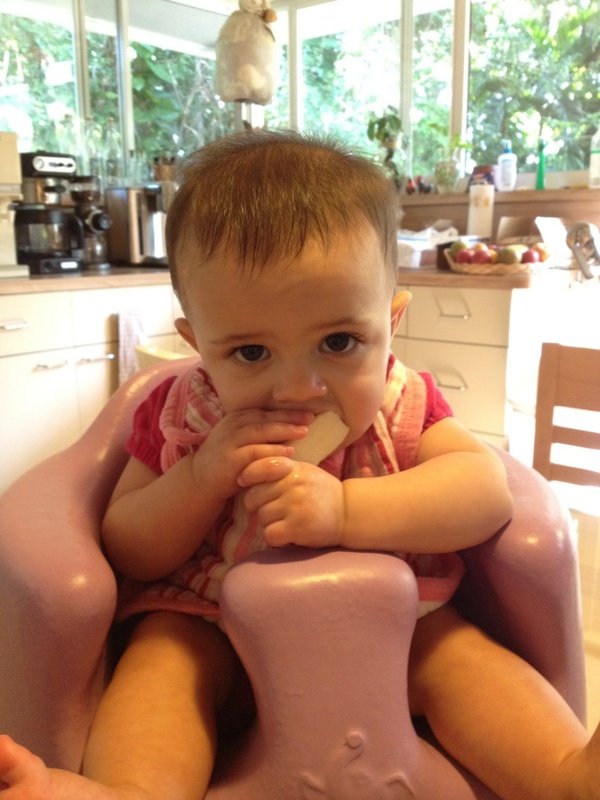 At Eliana’s 4-month check-up, our pediatrician told us to let Eliana lick or taste basically anything we were eating. Yep, anything. All those things we thought were big no-nos were okay. So, peanuts, eggs, shellfish, dairy – all good. She didn’t explicitly mention honey but I’m keeping that off the list. 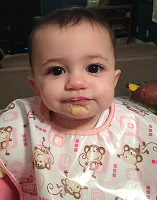 Our pediatrician also said to make sure we gave her a variety of flavors, textures and tastes so Eliana would have a “wide palate” and not eat a diet of bland, boring foods. So, Matt (that’s the hubby) and I let her try it all. It is fun and funny to watch her taste a variety of sauces, fruits, and vegetables. Eliana literally lapped it up. Apple slices, soy sauce, dal, hummus, oatmeal and more! I could tell right away she took after her Mama and was into food. Don’t even THINK about taking this apple away! So, now my mission is to keep introducing her to different flavors and textures. Not the typical rice cereal or apple sauce for three days in a row. Oatmeal with her applesauce, greek yogurt with her pureed pears, carrots with garlic and farro blended in, just to name a few. She loves it! Tonight’s menu? Sauteed kale with potatoes. Yum. I bet she'll love baby linguine, too! She's going to be such a good eater.